Michael Clifton just can’t seem to win an NASCAR Whelen Southern Modified Tour race. In the last series race, at Ace Speedway, Clifton had one of the fastest cars at the track, but power steering problems in the first 100-lap race dropped him out of contention and having to start at the back of the field ruined his shots in the second 100-lapper. On Saturday night at Caraway, it looked like the race was Clifton’s to win. Unfortunately, he lost it. “We just burnt the right rear off of it trying to stay out front,” said Clifton, who led 132 of the 150 laps after starting seventh. “I knew they were coming, but we were strong. We about lapped (Miller, Brown and Myers) in the first 50 laps. I knew right then we were going to have a pretty good car. “I car was real good at the start. Even about the middle portion of the race, I tried to take it easy and save the tires, but we burnt them up. Oh well. So Clifton might just be a race away from that first win. When will it come? During the middle portions of the race, it looked like it was going to be a very bad night for second-place points man Burt Myers. Myers had an ill-handling racecar and it was evident. In fact, he’d fallen all the way back to 12th in the 15-car field at one point, only out-running two cars that were having mechanical problems and one that was already out of the event. The #1 didn’t look very good. And it looked like the night was going to be a bad one for Myers. 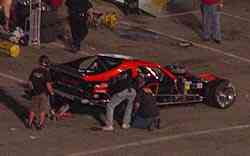 However, during the first caution, Myers came into the pits and his #1 crew made an adjustment. Myers stormed through the field after that, eventually working his way all the way back to third, which was key in losing minimal points to series’ points leader Junior Miller. “I feel like we ran two races tonight,” said Myers. “This isn’t normally the car we bring down here. We trashed that car in Martinsville. We thought we had this car tightened up. We were waiting for the first caution to bring it in and tighten it up more. “Golly, it felt like I passed 50,000 cars out there tonight. We came down here with a car that we weren’t planning on taking out the rest of the year and to have to come from the back isn’t too bad. 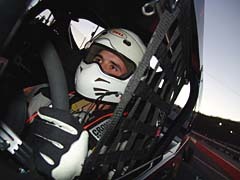 It was good to see two different drivers running up front on Saturday night at Caraway. Behind leaders Clifton, Jay Hedgecock and others, two of the senior drivers were coming. Frank Fleming’s #07 and Jay Foley’s #57 were each running and running fast. Foley started in fourth and ran around third and fourth all night. Fleming started 10th, and once he worked his way around some of the competitors, moved into the top-five and was on a march to the front. Unfortunately, neither driver would end up at the front at the end of the night. Fleming’s car would just eventually lose its handle. He fell back to 10th at the end. “My tires are wore out, but so are the guys’ that won,” said Fleming, looking at his car and wondering why it fell off so rapidly late in the race. “Our car ran good for 100 laps. I was right there in the hunt and I thought we were sitting god. I don’t know. my tires are wore out. My right front didn’t gain what it was suppose to gain. It wasn’t flat either. But our radiator cap was off. We are thinking the hood was touching the radiator cap and it popped it off and we were missing some water. That is what we are thinking now. “All racers have an excuse and that is what we are seeing here now. It is disgusting. This is the best race we’ve had in a long time. Usually, 40 or 50 laps and we’ve worn the car out. Tonight, we went over 100 laps and we were right there. Following qualifying on Saturday night, Brian Loftin drew the pole position after the invert. But problems before the start of the race would force him to start very last in the 15-car field instead of first in the 15-car field. Burt Myers' #1 visits pit road at Caraway. “We think we had a ratchet coming out tonight. The car was real twitchy all day. It tracked the wrong way going down the straightaways. We tried to change a bunch of things and we never really found the right stuff to make it work. “The car wasn’t handling well at all. It was bad. About the last 50 laps, I could barely keep it straight down the straitghtaways. I was having to ride the throttle through the corners to keep the front end straight. Loftin came back to finish eighth. Out of the 15 cars that started on Saturday night at Caraway, there was only one that failed to take the checkers. That was the #87 of Alex Hoag. Hoag had an eventful night. He got together with a lapped car and spun alone down the backstretch to bring out the first caution on lap 55. He got the car refired and pulled off, only to have problems again a few laps later. 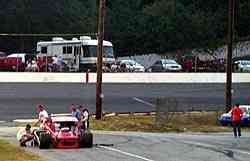 He banged wheels with the lapped car of Kevin Eckerich after a restart and came to a stop in turn three. The right front was heavily damaged. Following the race, Hoag wasn’t very happy. But he was able to shrug it off. The other Myers brother, Jason, has been on a little roll since skipping the combined Mod Tour show at Martinsville last weekend. 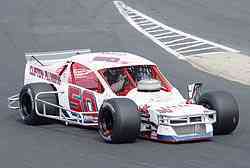 At Ace Speedway on Monday, he finished with third and sixth in the Twin 100s. On Saturdya night at Caraway, he finished a solid fifth. And he might have been able to have more. “We didn’t start too strong,” said Myers. “We started easy and stayed east until we had a caution around lap 60 or so and we picked it up after that. Here, you have to be there at the end. “We lost so much track position trying to get around the #23 that by the time we finally got around him, we couldn’t get a caution. I had too much time to make up. I think we had one of the best cars on the track at the end, but track position killed us. You have to save your car here. Brian Loftin's #23 sits all alone on pit road while the crew works on it to fix things.